FIIs were net buyers of equity on all four trading days. Their total net buying was worth Rs 41.2 Billion. DIIs were net buyers of equity on Tue. (Mar 5), but net sellers on the last three trading days. Their total net selling was worth Rs 16.9 Billion, as per provisional figures. Government’s indirect tax revenues will be under pressure during FY 2018-19 as there could be a further fall in GST revenue. Direct tax numbers are likely to be around the revised target. The fiscal deficit figure of 3.4% will be met as there will be some savings on expenditure. Inflows into equity mutual funds (including ELSS) declined 17% in Feb ’19 to Rs 51.2 Billion from Rs 61.6 Billion in Jan ’19. The decline is almost 60% from Oct ’18 inflow of Rs 126.2 Billion. However, SIP inflows have remained steady. In a holiday-shortened week, there was strong buying by FIIs. The index rose to test the upper edge of the Fibonacci resistance zone by touching an intra-day high of 36830 on Thu. Mar 7. Bears ensured that the index dropped to close about 140 points below the upper edge of the resistance zone. The index can make another attempt to climb above the resistance zone, provided FIIs keep buying. Slowdown in the global economy and the ongoing BrExit saga may dampen their bullish fervour. Daily technical indicators are looking bullish and overbought. MACD is rising above its signal line in bullish zone. ROC has fallen from its overbought zone towards its rising 10 day MA. RSI is moving up towards its overbought zone, but its upward momentum is weakening. Slow stochastic has started correcting inside its overbought zone. Bulls have the advantage as all three EMAs are rising, and the index is trading above them in bull territory. However, a corrective move seems likely. Many mid-caps and small-caps rose sharply during the week, and can face profit booking. The government is on a publicity overdrive – announcing grand schemes worth trillions and giving sops to different sections of citizens – before general election dates are announced. Hope it doesn’t become a case of ‘too little, too late’. Thanks to satellite TV, Internet and the proliferation of mobile phones, information dissemination has become instantaneous. Voters have become more savvy. Bullish sentiment can get a beating in the unlikely event of Modi not getting a second term. So, don’t go ‘all in’ just yet. 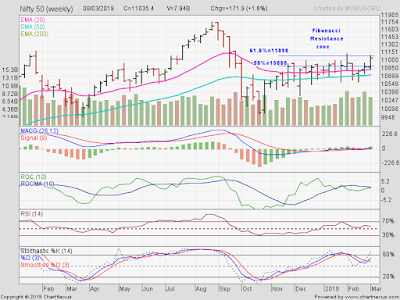 The weekly bar chart pattern of Nifty closed higher for the third straight week, and is trading well above its 20 week and 50 week EMAs in bull territory. But it failed to move above the Fibonacci resistance zone. The index touched an intra-week high of 11089 – testing the 61.8% Fibonacci retracement level of 11090 – but closed inside the resistance zone, with a weekly gain of 1.6%. Weekly technical indicators are in bullish zones. MACD is starting to move up in neutral zone. ROC is facing resistance from its sliding 10 week MA. Slow stochastic is rising above its 50% level. However, RSI is falling towards its 50% level, and showing negative divergence by failing to rise with the index. Nifty’s TTM P/E has moved up to 27.05, which is well above its long-term average in overbought zone. The breadth indicator NSE TRIN (not shown) has emerged from its overbought zone, and can trigger a corrective move. Bottomline? For more than 4 months, Sensex and Nifty charts have been stuck in sideways ranges after sharp corrections during Sep-Oct ’18. Both indices closed above their long-term moving averages in bull territories, but faced strong resistances from the upper edges of their respective Fibonacci resistance zones. 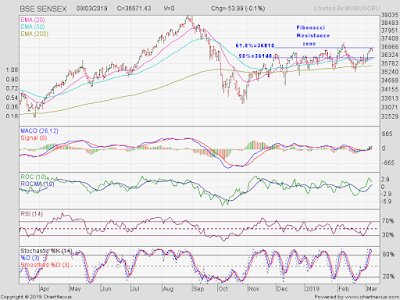 Index consolidations may continue till the general elections.